Drake dropped his official music video for “In My Feelings” on Friday, but not without paying homage to the challenge of the summer. At the end of the video, it cuts to a montage of celebrities dancing to the song, including the cast of “Queer Eye,” “Stranger Things” stars Millie Bobby Brown and Noah Schnapp, and Will Smith (whose take on the challenge was particularly epic). In case you weren’t aware, the “In My Feelings” challenge started when comedian Shiggy posted a video dancing to the track — which is the latest single from Drake’s new album “Scorpion” to hit No. 1 on the Billboard chart. Shiggy’s video soon when viral with others putting their own spin on his dance moves. Shiggy landed the role of annoying set PA in the video for his efforts. The music video takes Drake to New Orleans, where in a Romeo-and-Juliet-meets-Say-Anything meeting, he tries to convince Keke, who is named in the song, that he loves her. After some pretty funny back-and-forth with her mom, Drake leaves and we’re taken into the city. At the end of the clip, Drake wakes up suddenly, and it was all a dream. “I just had a dream that I made some song about some girl… and some kid from New York who spits when he talks made a dance to it and then the world did the dance, and Will Smith was there,” Drake says after waking from his nightmare. “Nobody would stop, it was terrible,” Drake says in the video of the non-stop dancing to the song. After 'Three Billboards Outside Ebbing, Missouri" walked off with the top film prize to end the show, parties broke out in every corner of the Beverly Hilton and neighboring Waldorf Astoria. Ricky Martin, Drake, and Mariah Carey joined the winners. Allison Janney and her entourage went wild over her win for "I, Tonya" at Warner Bros. and InStyle's thumping bash. From the moment DJ Michelle Pesce dropped Blondie's "Rapture" to begin the night, the converted Oasis Courtyard had a pulse. In the back right corner of the same party, the ultimate cool kids table was packed 10 deep with stars and their advocate guests: From the top left, this squad included Susan Sarandon, Emma Watson, Eva Longoria, Kerry Washington, Michelle Williams, Laura Dern and (bottom left to right) Hong Chau, Reese Witherspoon, activists Ai-jen Poo, Marai Larasi, and Tarana Burke. Matt Damon, a peek-a-boo Luciana Barroso, Taika Waititi, Amazon CEO Jeff Besos, and Chris Hemsworth joined the celebration for Amazon's wins for "The Marvelous Mrs. Maisel." Later, Damon and Barroso were dancing to The Weeknd's "Can't Feel My Face" as the party heated up. At Hulu's party with Fox and FX, the three "Handmaid's Tale" women whose characters live in Commander Waterford's house -- Elisabeth Moss, Amanda Brugel, and Yvonne Strahovski -- create a scene that would never fly in Gilead. Justin Timberlake is the next big thing coming to NBC. Exactly four weeks after the show, he'll be performing at the Super Bowl Halftime Show. At the network's party on Sunday night, he celebrated with victor Sterling K. Brown. The view from one rooftop party at the Beverly Hilton looking out towards another. HBO celebrated downstairs over the pool while Fox/FX/Hulu created a space on top of the parking garage. Back at InStyle and Warner Bros.' soiree, Ashley Judd, Mariah Carey and Leslie Bibb shielded Sam Rockwell and his supporting-actor trophy for "Three Billboards." Later in the night, Judd and Salma Hayek would roll in to the HBO party together. Saoirse Ronan and James Franco toasted with the wrong gold item in this picture. These are two thirsty winners in search of a champagne glass. At Fox and FX's party on the Beverly Hilton rooftop, Angelina Jolie poses with Ewan McGregor. Between McGregor's win for "Fargo," and two wins for "The Handmaid's Tale," it was a successful night for Gary Barber and MGM Television. Put the Emmys on repeat: "Big Little Lies" cleaned house again with four trophies, winning more than any other TV show and giving HBO the top spot on the TV network scorecard. Natalie Portman, America Ferrera, and Eva Longoria anchored a choice banquette in the back corner of InStyle's bash, with Gayle King and Lena Waithe as their table neighbors. Mark Ronson (pictured) and sister Samantha both performed at Amazon's bash. It was slightly surreal to see Mark spin some of the songs he wrote, like "Uptown Funk," a catalogue hit that looks like it's never going away. Drake, Netflix Chief Content Officer Ted Sarandos, the victorious Aziz Ansari, Mary J. Blige and Pharrell Williams set off flash bulbs at Netflix's party atop the Waldorf Astoria. This was the first Golden Globes since the luxury hotel opened next door to the Hilton, expanding the industry's party playground. Drake has Denzel Washington, Sade, Lil Wayne, and his father tattooed on his body. Alfre Woodard may be getting close to ink status. For now, Drizzy genuflected in her presence. Tommy Wiseau, the real life "Disaster Artist," had guests at InStyle shouting "Tommy! Tommy!" as he entered the room. He didn't make it far without stopping for photos, including this one with Seth Rogen and the filmmakers. As they did on Emmy night back in September, the creative ensemble behind "The Handmaid's Tale" had a lot to celebrate. From the left: Alexis Bledel, Yvonne Strahovski, Hulu SVP/Head of Content Craig Erwich, Moss, Madeline Brewer and Amanda Brugel. Aziz Ansari provided the lone win for Netflix, but you would never have known that from their party. Here, Edgar Ramirez and Ricky Martin (who has his own FX premiere for "The Assassination of Gianni Versace" on Monday night) join the creator/actor at the bash. Recently engaged Paris Hilton and Chris Zylka put it all on display for photographer Todd Williamson. These two were amongst those who rode the elevators up to Amazon's party in the penthouse without incident. One of the elevators broke, briefly trapping some guests for about five minutes, according to a Beverly Hills Police Officer on scene who spoke with The Party Report. Halle Berry (with Bezos) presented earlier in the night. Hailing from different wings of the ABC network, "Bachelor in Paradise's" Wells Adams and "Modern Family's" Sarah Hyland are going strong as a couple. They hit Amazon's party along with Tyrese Gibson and Nicole Scherzinger. "Scherzy" recently wrapped a buzzy season of "The X Factor UK" which launched a group to the top of the charts. 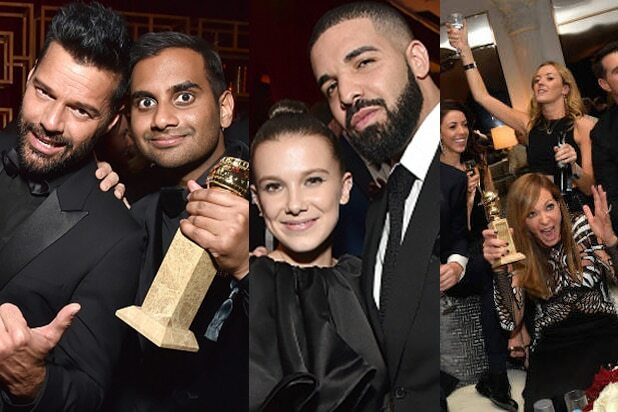 From Eleven's power to control to "Controlla": Millie Bobby Brown and Drake. For more from inside and backstage the Golden Globes party scene, click over to our gallery of the starry pre-show scene across L.A. Hot off his success hosting the Globes (and with his pregnant wife Alexi Ashe somehow still standing), Seth Meyers attended his own official after-party at The h.wood Group’s Poppy nightclub in West Hollywood, presented by Beats By Dre and Perrier-Jouet. Former "Mad Men" maven Christina Hendricks may soon be back on the awards watch list with her new NBC sitcom "Good Girls," but on Sunday, she was just enjoying the party at Poppy. "This Is Us" actor Justin Hartley and his wife Chrishell Stause were among the guests at the h.wood Group’s celeb-filled bash. While "This Is Us" is a fan favorite, Hartley played fanboy over one of his idols, Mariah Carey.